Fathers 2 - Anglia Counselling Ltd. Contrary to popular belief, a father is fallible! Fatherhood is anything but an exact science. A father, just as any other human, will communicate (at times) less efficiently or ideally as he would care to because of ‘lack of knowledge’, or other factors such as stress, their experiences as a child… the list could go on and on. Fathers, who put you in charge? You are a bi-product of your upbringing and your experiences in life; it is acceptable, actually preferable that you make mistakes or how else will your child learn this? Do you really want your child to put you on an impossible to maintain ‘pedestal’? Sure, we all want our children to be in awe of us and to turn to us in times of need or simply for a reassuring hug, and why not? Remember though, you can and should be a human who can demonstrate ‘ignorance’, show pain, weaknesses, and areas for development and even turn any areas of knowledge deficit into joint learning exercises where you are able! Try Laughing at yourself – with your child!!! It is never too late to redress that which you believe caused harm! Acknowledge any actual or perceived failures and forgive yourself. If an issue needs talking through, do this… and then leave it where it belongs. You co-created a legacy. Your responsibility is, simply, to do your best and care. Doing your best is what YOU know to be your best; for others, it is simply perception. Forgive your mistakes, your harsh words and criticism, your inappropriate behaviour at times. 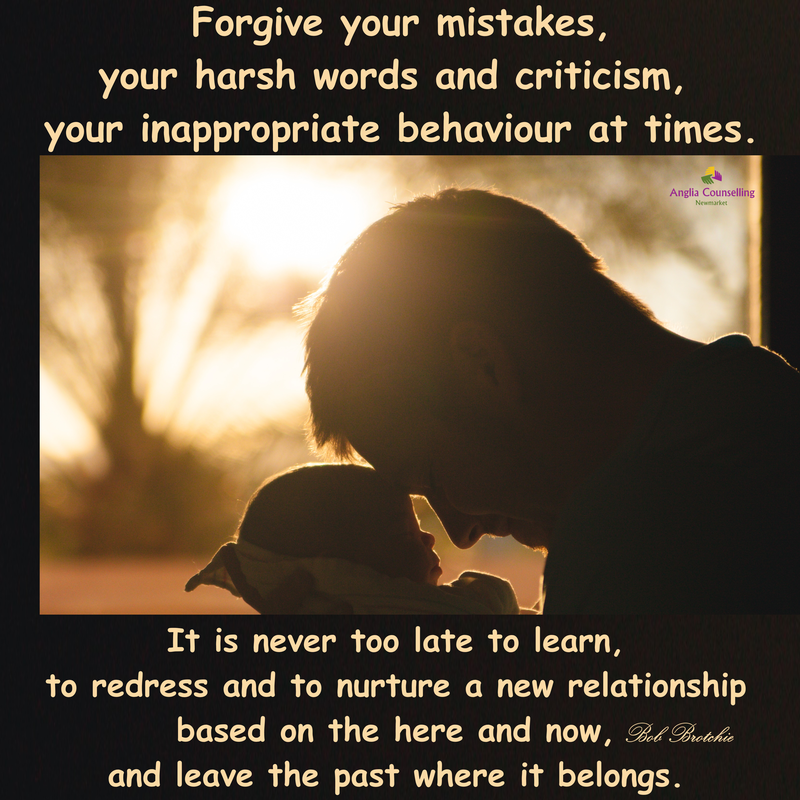 It is never too late to learn, to redress and to nurture a new relationship based on the here and now, and leave the past where it belongs. It often helps to talk to someone impartial and outside of the family about how you feel, what you want to communicate, how to express your feelings. It also helps to understand first and foremost why you feel or felt the way you do. Please do share your experiences and help yourself to help others via my You Tube Channel or email me at the details below and I will put the main themes out as a follow up article. I will maintain anonymity where requested. For more advice, in person or via phone please contact me, Bob Brotchie or give me a call on 01638 563 222. If you are outside of the UK, send me a message and we can talk online as I do with many of my clients.